Where and how does bone resorption occur? The bone cells carry out their remodelling preferably on the inner surface of the bone, the endosteum (Fig. 13.1). Bones with a large component of cancellous bone present the largest surface area to bone cells for remodelling: these bones include the vertebral bodies, the femoral neck, the ribs, the wrist and the heel. Due to their immense surface, these cancellous bones are resorbed five times as fast as the cortical bone of the long bones (Fig. 13.2a, b). Considered sequentially the ossicles in the middle of the bone disappear first, especially those at the horizontal “stress” lines. The vertical “pillars” which carry greater loads remain intact for longer periods and are seen as vertical stripes on X-ray (Fig. 13.3). 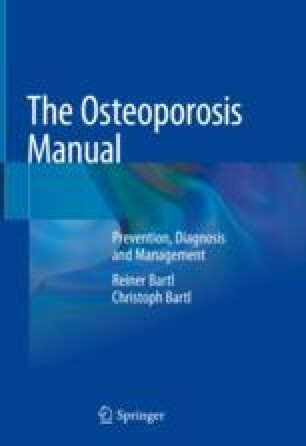 In vitro and in vivo studies have shown that bone density is indeed responsible for 50–80% of the strength of the bone and therefore constitutes a very important risk factor particularly in postmenopausal women. As numerous prospective studies have demonstrated, the risk of a fracture increases exponentially with the decrease in density: a reduction of 10–15% in bone density doubles the fracture risk.